And Justice For Art: An Infinite Skull-Filled Landscape: Making Burning Hatred's "Carnage" Cover. An Infinite Skull-Filled Landscape: Making Burning Hatred's "Carnage" Cover. 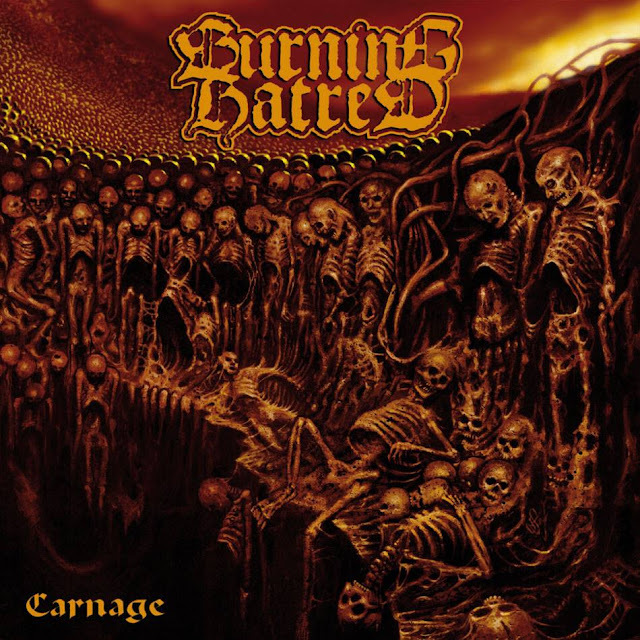 Dutch death metallers, Burning Hatred​, just released their new album, titled "Carnage" via Vic Records​. The album's stunning cover was painted by The Crystallomantic Art​. "This artwork is an acrylic painting and was actually created way back in 2014 when Burning Hatred's guitarist, Martin Brakert, approached me and asked if I would be interested in creating the cover for the then still-to-be-recorded album "Carnage". I had previously collaborated with Martin and his other band Anarchos for whom I had created the 'Descent into the Maelstrom' EP cover and we had developed a good working relationship," comments Crystallomantic's mainman, artist Wolven Claws​." 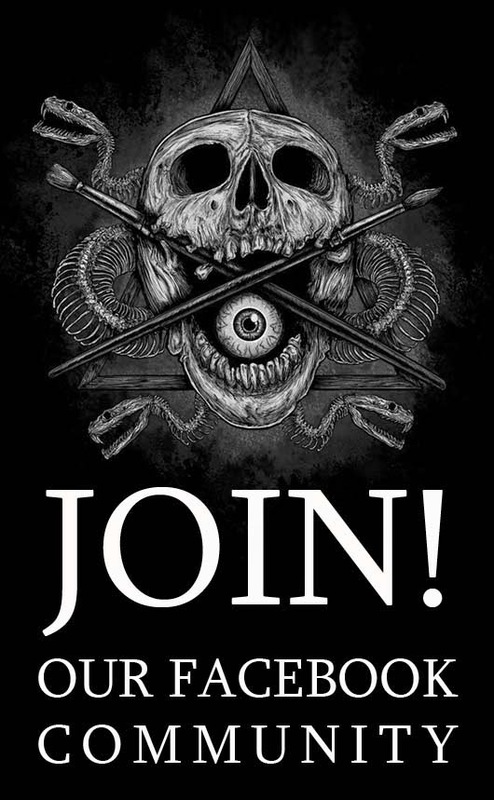 "The concept brief from the band was to depict a pile of dead bodies shrouded in mud with a pit in the foreground," Wolven Claws comments, exclusively for And Justice For Art​. "I was given links to various concentration camps and POW camps and various massacres for inspiration. I was also pointed towards a particular artwork by the Polish artist Zdzisław Beksiński​ to provoke the overall feel the band wanted as well as its colors and tonal values... The layout of the design was pretty spontaneous and stayed unaltered from start to finish. However, during the final stages, I came up with the idea of painting lots of skulls/ rotting heads disappearing off into the background to create an extra sense of perspective. I messaged Martin and asked 'how many dead bodies do you want in the artwork?' to which he replied 'hundreds!' so I literally added hundreds of heads buried in mud." The creative process presented some unexpected problems. "First, the place where I took it to be scanned had problems with its scanners and ended up with colored stripes running down the entire artwork which I had to digitally remove. Then, my computer crashed whilst saving the final image and I lost part of the top of the art which I had to redo digitally. Apart from that I think it turned out pretty good." The band is also very satisfied with the finished result. Guitarist, Martin Brakert, comments: "We are impressed and proud of the artwork Wolven made for us. It really suits the music and the artwork sums up the lyrical content of the "Carnage" album. You see the somberness, terror and death of the lyrics in this piece of majestic art." Burning hatred always has something incredible to release and this time their 'Carnage' will be a great hit I must say. Keep posting about their reviews too.